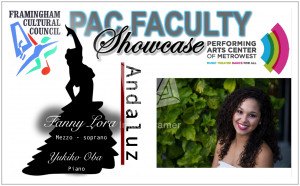 The Performing Arts Center of MetroWest (PAC) is proud to host Fanny Lora, mezzo-soprano and Yukiko Oba, Piano, in Andaluz. This musical showcase will be held at Harris Hall in St. Andrew’s Episcopal Church at 3 Maple Street in Framingham from 3:30-5:00pm. Tickets are $25 for general admission and free to audience members age 15 and under. Fanny Lora’s Andaluz takes us on a musical journey through the history of Southern Spain. This event features over a dozen beautiful songs that showcase different styles of Andalusian music such as Sevillanas, Zapateado and Flamenco, including songs that have never before been recorded by composer Isidoro Hernández González. Fanny Lora will be joined by the accompanist, Yukiko Oba, along with the dramatic flamenco dance of Natick’s own Eve Costarelli. This event is sure to be one of the most memorable events in the history of PAC. Summer Theater Registration Is Open! The Performing Arts Center of MetroWest is excited to announce that registration is open for the Summer Music Theater program, now in its 30th year. Two-week workshops for kids entering grades 3-8 conclude with fully-staged, ticketed productions that are open to the public. All participants will be cast, and will have a fantastic opportunity to participate in all aspects of musical theater, from sets to costumes and more. Tuition: $725 per two week workshop and includes t-shirt with the show logo! July 8 – 19, 2019: Madagascar Jr.
July 22 – August 2, 2019: Mary Poppins Jr.
August 5 – 16, 2019: Frozen Jr.
Have a teen who would love to participate in a summer theater program? We’re always looking for student volunteers to assist with our productions. This is a great opportunity for teens to get some exposure to all of the behind-the-scenes elements of working on a fully staged show, from costumes, props, and makeup to the larger aspects like lighting and sound. Be sure to let us know if your scholar would like to participate. We would love to have them on board.